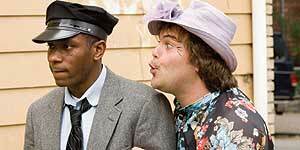 For the most part, Be Kind Rewind is an imaginative and charming comedy but the charm wears off after about an hour and the finale is disappointing. Written and directed by Michel Gondry, Be Kind Rewind stars Mos Def as Mike, a loyal video shop employee who's left minding the store when his boss (Danny Glover) is out of town trying to save the business. However, Mike soon finds himself in trouble when his manic best friend Jerry (Jack Black) gets himself magnetised and accidentally erases all the videos in the store. When a slightly dotty customer (Mia Farrow) requests Ghostbusters, Mike decides to re-make the film himself, hoping she won't notice. However, word quickly gets around and soon their homemade versions are in high demand, so they enlist more and more locals in their remakes of films like King Kong, Robocop and 2001: A Space Odyssey. Mos Def is a likeable lead, though he underplays it a bit too much, while Black gets away with his manic excesses because his character is meant to be irritating. There's also terrific support from Melonie Diaz, who gives a charming, sweet-natured performance as the wannabe actress who becomes the third member of the team. The first half of Be Kind Rewind has a lot of the same ramshackle, here's-one-I-made-earlier charm as Gondry's previous film The Science of Sleep and the short clips we see of the remakes are both funny and inventive, particularly in their use of cardboard special effects. Similarly, there is a truly inspired visual gag early on that provides the film's biggest laugh. Unfortunately, the film runs out of both ideas and charm at about the 60 minute mark and the final act is both weak and unsatisfying, abandoning the invention of the first hour and settling for an attempt at Frank Capra-esque whimsy that doesn't really come off. In short, Be Kind Rewind is worth seeing for its inspired and delightful first half, which just about compensates for a disappointing finale.